Transition from primary to secondary school – how do you make this successful? What needs to be done? When? How does this happen? Eg Wilmslow High School hold two question and answer evenings at Wilmslow primary schools in SeptemberEg Wilmslow High School holds an Open Evening and an Open Day during late-September / early October. 2. Parents apply for secondary school place Year 6 – September – October Make sure that the relevant admissions arrangements are known and understood – consult admissions booklets published by local councils and ask if anything is not clear. Submit completed application form to the relevant admissions team by the deadline. Year 6 – March Admissions team process applications received by deadline dateand use published criteria to determine whether parental preferences can be met. Admissions team publish decisions about secondary school places. 6. Specialist secondary school staff work with pupils with specific individuals needs and their families Year 6 – April onwards Although this process starts intensively from April onwards in Year 6, for many of these pupils transition work will have already begun much earlier in their primary years. Many primary pupils will have experience of their local secondary school through local education partnership activities (eg sport and the arts). Formal transition days are normally run by secondary schools during the second half of the Year 6 summer term. For example, Wilmslow High School invites Year 6 pupils in groups of 70-80 pupils for two-days of curriculum experiences during June-July. 10. First day and first week at secondary school Year 7 – September Many secondary schools invite new students in to start on their own a day before the rest of the school students return. In addition, Wilmslow High School has a New Parents’ Evening during the first week of term involving presentations from the Headteacher, other senior staff and the Head Boy and Head Girl. 11. 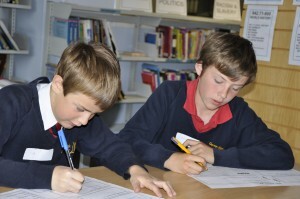 Settling in reviews Year 7 – November Many secondary schools hold an additional Parents’ Consultation Evening for Year 7 early in the academic year in order to provide early two-way feedback of how the students have settled in. At Wilmslow High School this takes the form of another timetabled one-to-one meeting between parents, child and their new Form Tutor.